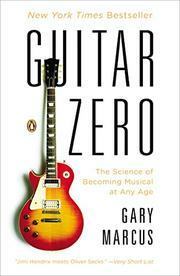 To paraphrase Bruce Springsteen, can a 38-year-old tone-deaf professor of cognitive psychology get a guitar and learn how to make it talk? That’s the question Marcus (Psychology/New York Univ. ; Kluge: The Haphazard Construction of the Human Mind, 2008, etc.) asked himself a few years ago, and this intelligent, educational and exuberant book is his answer. Marcus approached his lifelong dream from both a personal and professional level; he wanted to play, but he also wanted to challenge the “critical periods” theory of learning, which suggests that you should learn music early or not at all. The author threw himself into mastering his ax, pushing the limits to see just how far a new trick could take an old dog. In the process, he explores how the senses reorganize to adapt to new information and investigates where music comes from, what evolutionary function (if any) it serves and why some people have rhythm and others don’t. Marcus asks eternal questions on which the jury is still out: Where does talent come from? How far will sheer hard work take you? Why are there countless obsessive, 24/7 guitarists, but there’s only been one Jimi Hendrix? Why do the most dedicated composers of rock and pop songs fall far short of what Bob Dylan or the Beatles accomplished in their 20s? Is it genetic? Nature or nurture? The author sought opinions and advice from people across the music world—e.g., jazz impresario Pat Metheny and Tom Morello of Rage Against the Machine—and even attended rock-band camp, humbling himself to audition for a band of 11-year-olds who needed someone on bass. Whether or not readers (aging or otherwise) will profit by the author’s example, this enjoyable blend of music appreciation, science and personal exploration commands a new respect for how the brain and body responds to the promise, and shock, of the new.